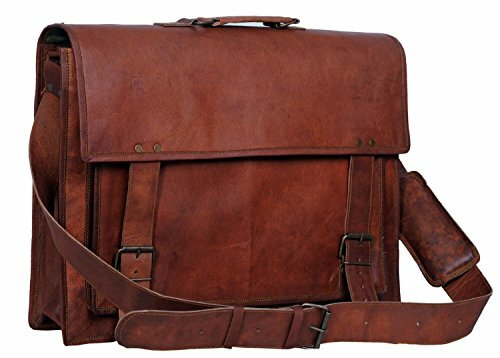 messenger bags/satchel briefcase bags are all built to last the test of time. All genuine vegetable tanned goat leather is 3-4 oz, processed to withstand almost any condition. Features include; variety of inside and outside pockets for convenience, adjustable shoulder strap, and a strong resistant Canvas. The leather is not processed by any chemicals or dyes. Natural vegetable oil is used on the bags to pick up texture when it is left out in the sun for sun tanning. The bag/leather will get soft and will pick up more texture with the age of the bag. Please note that the bag color may vary from the picture because of the natural tanning process. 100 % genuine leather with durable canvas lining, YKK Zippers Size: 18" width x 13" height x 6" depth, durable top handle and adjustable shoulder strap One outside back zipper compartment, Pen Holder, Big Front Pocket for iPad/Tablet, 2 small inner compartment, 1 big inner compartment for Laptop, 2 Inner zipper compartments Easily fits laptops, tablets and devices up to 17 inches, A4 Magazine book and iPad MANY BUYERS COMPLAINED OF THE BAD QUALITY because they selected these offers. In order to get a top quality bag , PLEASE BE CAREFUL WHILE MAKING YOUR PURCHASE . PLEASE CHECK THE BRAND NAME AND SELLER NAME (CLASSY DESIGNS ) before buying the product.